Three fights on the UFC Fight Night St. Petersburg prelims, three KOs. Shamil Abdurakhimov landed several big punches to defeat Marcin Tybura by second-round TKO at 3:15 in the second round of their heavyweight bout. Time for the big boys to take center stage in St. Petersburg. Marcin Tybura (17-4), a Polish heavyweight coming off a win over Stefan Struve, faces Russia's Shamil Abdurakhimov (19-4), last seen beating Andrei Arlovski. 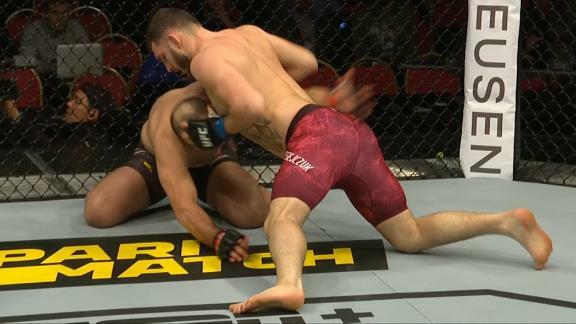 Michal Oleksiejczuk devastated Gadzhimurad Antigulov with a flurry of punches and earned a first round TKO in just 44 seconds on the UFC Fight Night prelims in St. Petersburg. Alistair Overeem and Aleksei Oleinik face off in a heavyweight main event of UFC Fight Night on Saturday in St. Petersburg, Russia. Follow along with live results of every fight. Michal Oleksiejczuk drops Gadzhimurad Antigulov three times in the first round for a knockout. For more UFC action, sign up for ESPN+ at https://plus.espn.com/ufc.